two peas & the dog: boozy dessert. pear & riesling pops. Not sure if boozy desserts is a topic that will stick but we can try it out. It's hot here in Adelaide. What does hot weather mean in this kitchen? Less red wine and more white wine, obviously. I recently came across Food & Wine's Pear & Riesling Pops. I gave it a whirl tonight. Recipe and results to come soon. In a small saucepan, combine the sugar and water and bring to a simmer, stirring to dissolve the sugar. Pour the syrup into a bowl and let cool. Add the pears and lemon juice to the syrup and toss well. 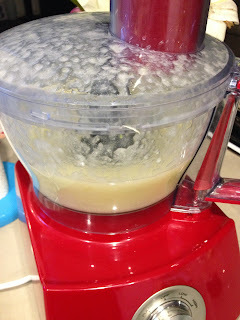 Transfer the pears and syrup to a food processor and add the Riesling. Process to a smooth puree. Pour the puree into six 1/3-cup popsicle molds and freeze until hard, at least 1 hour. Make Ahead The pops can be frozen for up to 1 week.